There’s a lot of talk about “work/life balance” and figuring out how to find some sort of perfect equilibrium wherein your personal life is completely divided from your work building a startup. This is not about that. In fact, it’s about the opposite. It’s about accepting they can’t possibly be separated, and that perfect equilibrium doesn’t exist. However, it’s not all doom and gloom. There are quite a few ways to help mentally process and sort through running your own business in a way that’s actually healthy for you and those around you. There’s this hero mentality that is pervasive in startup culture where you’re expected to be all about your company. You eat, breath, sleep and poop your company. Maybe you can have a hobby or two outside of your startup, but as far as perception goes, you’re a human being with a singular focus: your company. I see it most often in first-time founders who are fresh out of school and legitimately are 100% about their company. On the surface this feels like the right move. Many times there’s a lot on the line. You’re either playing with your own savings or someone else’s money. You’ve got a whole team of people depending on you not to blow it. This particular company is your “best idea ever” and you treat it like your life’s work. Of course you want to be 100% about your company, anything less would seem irresponsible. You get this urge to try to completely separate “work” and “everything else” so you can have some sort of superhuman focus and hit whatever seemingly impossible goals you have. The problem comes when life happens. And when life happens, if you don’t have certain habits and systems in place, it can ruin you and your company. I think a lot of founders have this view that if they can just hold off on non-startup stuff for long enough, they can get their company to some mythical, self-sustaining-machine status and then they can get back to friends, family, hobbies, etc. I don’t know of a single case where that’s actually played out well, though. Everybody’s got something they’re dealing with. Every. Single. Person. Founders included. Right this moment I know of founders who are going through divorces, grieving the loss of siblings, fighting cancer, helping their kids fight cancer and everything in between. Welcome life events also require a certain amount of ‘dealing with’. A year ago, we adopted two older children from another country who didn’t speak our language, and the life change that came from that event has had a profound impact on me and the way I run this company. The fact is, you can’t separate work and life. My kids and the struggles we’re facing obviously make their way into my head during the day. A fight you have with your spouse, a sick family member, financial troubles…all of those things you’re going through will permeate your thoughts. If you don’t face those things or accept that they influence your decision making and the way your run your company, you’re in denial. I made some mistakes in the past year with how I handled our transition from a family of three to a family of five, but I also think there were things I did correctly before we adopted that prevented the struggles we’ve had with our adoption from bringing me (or our company) to a halt. There’s no prize for taking the least amount of vacation. Your team will function just fine while you take some time off. Arguably, they’ll likely function better in the long run when you’re properly taking care of yourself. I’m not talking about taking an afternoon off here and there, I’m talking about taking multiple days (or even weeks) off with zero interaction with your company. Burnout is real and once it hits you, it’ll take a lot longer to get out of that funk than just a couple of days off. Your brain needs time to disconnect and organize all the junk you’ve got bouncing around in there. You’ll come back refreshed and in a much better spot to make the decisions you need to on a day-to-day basis. Yes, having a bunch of other founders around you is great for learning how to grow a business, but it’s not so great for dealing with life. You need people around you who get your head out of the startup world. You need to build relationships that will persist long after your company is gone. 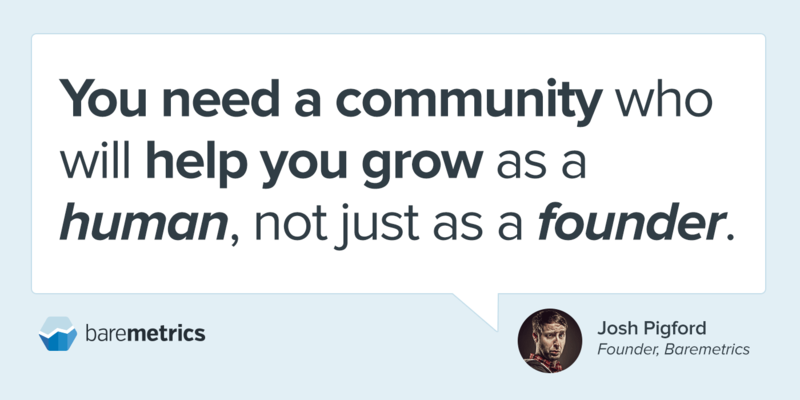 You need a community who will help you grow as a human not just as a founder. I can’t overstate the importance of interests outside of your work. Not only will it make you unboring as a human being, it also has the added bonus of making you a better problem solver…which is essentially all being a founder really is. Having hobbies gives you a mental break while also giving you new perspectives on your product and your team. My current hobbies of choice are gardening and Arduino. Acting like you’ve got all your junk together is the last thing you should do. Yes, there’s a certain level of stability you need to provide for your team, but that “hero mentality” I mentioned earlier doesn’t help anyone. Be clear when you’re struggling with things. If anything, it keeps your team from playing the hypothetical “I wonder if something is wrong? !” game in their head, which is destabilizing for everyone. Let your team know what’s going on. You’ll be less stressed for it, and have the added benefit that your team will be more likely to come to you when something is going on in their life. Building a company isn’t about a product, it’s about people, and trying to somehow fully divide “work” and “life” will leave you feeling pretty lonely. Abandon the hero mentality, embrace the fact that as a founder, “work” and “life” fully bleed into one another.